Tropical Bottling Company is the cannery to trust with all of your tea, flavored water, energy drink, flavored coffee, nectar, sparkling juice and soft drink manufacturing. Our team has the industry knowledge and experience to provide best recommendations on a wide variety of beverage packaging and manufacturing topics, and our facility has the equipment and storage space needed to handle your order from beginning to end. With vast capabilities, Tropical Bottling Company can assist established beverage manufacturers and start-up beverage makers alike. Our cannery can offer our customers multiple mixing technologies, hot and cold fill pasteurization, cold fill processes, reverse osmosis water treatment, fructose, liquid or granulated sugar sweeteners, and much more. To ensure the highest levels of quality control, we have outside quality assurance laboratories to test the safety and quality of the products made at our cannery and an on-site quality control manager to oversee production. Our cannery is also HACCP Certified by SGS as an added beverage safety measure, registered with the Florida Department of Agriculture, and working towards multiple other certifications to better serve a broader customer base. For full certification credentials, read on. Our cannery is also one of the few to provide trial programs to beverage makers who have new products coming to market. These trial programs allow beverage makers to book our cannery for single or half day productions runs, which helps save your company money when testing new products in the marketplace. 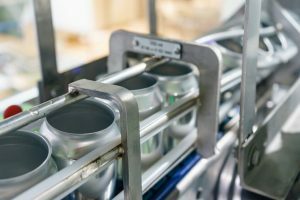 If you are a beverage maker from Florida, Georgia, South Carolina, North Carolina, Tennessee or other US states and are looking for a reputable cannery with the experience and equipment to expertly co-pack your products, look no further than Tropical Bottling Company. Contact us today to get started! We are the cannery to trust with the best-in-class tea, water, juice, coffee and soft drink manufacturing you need to get your products on store shelves.